EnGenius DuraFon Pro By EnGenius Technologies, Inc.
No other phone comes close! Note that this phone does not come with a speakerphone or answering machine. 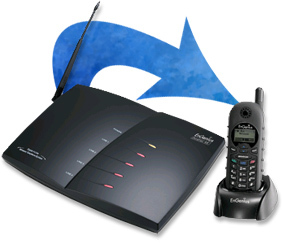 External digital answering machines are available starting at $26.97. Panasonic 5.8 GHz Frequency-Hopping Spread Spectrum technology operates on a different wavelength with much less traffic than the 2.4 GHz technology while maintaining the great security, incredible clarity and long range. The 5.8 GHz technology will not interfere with wireless networks such as 802.11b or 802.11g WiFi. 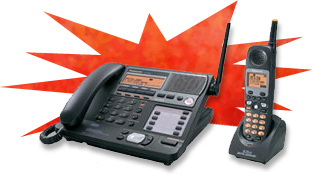 All-Digital Voice Mail System. with up to 100 minutes of recording time and up to 8 mailboxes1, plus such features as pre-recorded outgoing message, remote operation, Tollsaver, and skip-and-repeat. And don't worry about losing your messages when the power goes out-they're stored in flash memory so they're unaffected by power failure or interruptions. If the Power Fails, Don't Worry--You Can Still Finish Your Call The KX-TG4500B is unlike most other cordless phone systems when the power fails. The base unit will transmit calls during a power (AC) outage for a limited time. Other standard features include Digital Duplex Speakerphone, remote Access with voice prompts, Call transfer, message transfer, deliver message and auto message delete, Headset Jack on Base & Handset and more.